Wikipedia describes Erikson's work as follows: "Erikson's research suggests that each individual must learn how to hold both extremes of each specific life-stage challenge in tension with one another, not rejecting one end of the tension or the other. Only when both extremes in a life-stage challenge are understood and accepted as both required and useful, can the optimal virtue for that stage surface. Thus, 'trust' and 'mis-trust' must both be understood and accepted, in order for realistic 'hope' to emerge as a viable solution at the first stage. Similarly, 'integrity' and 'despair' must both be understood and embraced, in order for actionable 'wisdom' to emerge as a viable solution at the last stage. 1. hope - Basic Trust vs. Mistrust - Infant stage. Does the child believe its caregivers to be reliable? 2. will - Autonomy vs. Shame and Doubt - Toddler stage. Child needs to learn to explore the world. It is bad if the parent is too smothering or completely neglectful. 3. purpose - Initiative vs. Guilt - Kindergarten - Can the child plan or do things on his own, such as dress him or herself. If "guilty" about making his or her own choices, the child will not function well. Erikson has a positive outlook on this stage, saying that most guilt is quickly compensated by a sense of accomplishment. 4. competence - Industry vs. Inferiority - Around age 6 to puberty. Child comparing self worth to others (such as in a classroom environment). Child can recognize major disparities in personal abilities relative to other children. Erikson places some emphasis on the teacher, who should ensure that children do not feel inferior. 5. fidelity - Identity vs. Role Confusion - Teenager. Questioning of self. Who am I, how do I fit in? Where am I going in life? Erikson believes that if the parents allow the child to explore, they will conclude their own identity. However, if the parents continually push him/her to conform to their views, the teen will face identity confusion. 6. love (in intimate relationships, work and family) - Intimacy vs. Isolation - Young adult. Who do I want to be with or date, what am I going to do with my life? Will I settle down? This stage has begun to last longer as young adults choose to stay in school and not settle. 7. caring - Generativity vs. Stagnation - the Mid-life crisis. Measure accomplishments/failures. Am I satisfied or not? The need to assist the younger generation. Stagnation is the feeling of not having done anything to help the next generation. 8. wisdom - ...Integrity vs. Despair - old age. Some handle death well. Some can be bitter, unhappy, and/or dissatisfied with what they have accomplished or failed to accomplish within their life time. They reflect on the past, and either conclude at satisfaction or despair." 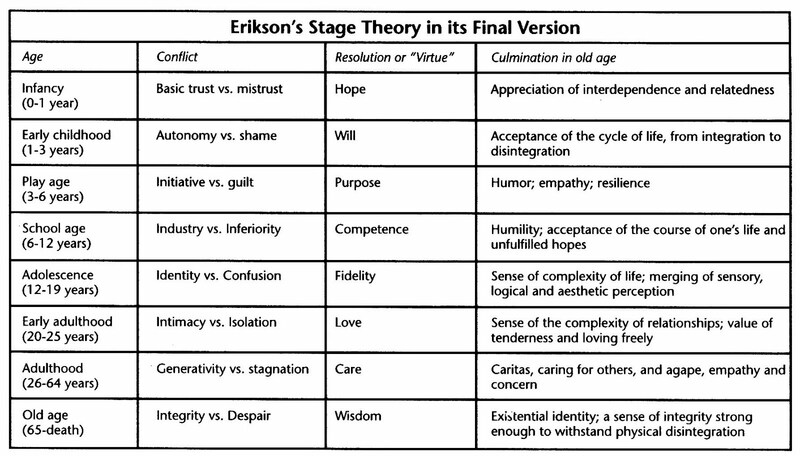 If you have been fortunate, you may already be familiar with Erik Erikson and his 'stages of psychosocial development'. The psychological and social tasks have been amplified, as you will see in the following adaptations of his stage theory, as crises or conflicts we face in the different developmental stages of our life. Erikson also identifies the results if we favorably negotiate these developmental passages/tasks/crises, and the results if we do not. It can be an informative exercise to ponder the years of your life in light of Erikson's stages to get an idea of whether or not you were able to favorably master the psycho/social competencies of each stage of life. Not to worry, if you realize that circumstances did not foster the development of the competencies of a particular stage. Life keeps offering us opportunities to make up for what we missed - although vestiges of the unrealized development may haunt us or be our Achille's heel. When 'Achille's heels' trip us up, we can use them as signals to get back on track. When referring to 'generativity' as a task of middle age, Erikson is referencing our ability to generate productive work, generate/create a family, generate a home, be a contributing member of society - all in service of the next generation, or in service of the continuation of life - ours, our family's and future generations. In his original work the last psycho/social task in the elder years was written as 'integrity vs. disgust and despair'. The above adaptation has left out the word 'disgust'. The 'disgust' referred, I think, to the bitterness you will sometimes see in older personnes who have not done the work (tasks) of the previous developmental stages, have not pulled all the parts of themselves and their life together, have not come to terms with their particular balance sheet of gains and losses, and in particular have not come to terms with their task/crisis of preparing to let go of life. Some of this is detailed in the adaptation below where the author has added a column to show how each successfully negotiated stage of development will then manifest itself in our later years. If in looking at these charts you discover that there are psycho/social task you have not negotiated or managed well - don't despair. You have just discovered where your work lies. * Do you have issues with trust? * Are you able to be autonomous and initiate? * Are you able to maintain loving relationships? * Have you been able to work, build, produce, create with others? * Do you have a grounded sense of who you are and what matters to you? * Have you come to terms with the harsher realities of life? If the answer is no to any of these, then time to apply yourself to mastering these skills, understandings, ways of being. It is not too late. Do not mistake a child for his symptom. "In the best family situations, trial and error, on the part of the parents as well as the child, gradually build up the child's confidence that the world is neither a totally threatening nor a totally pleasurable place, but an ambiguous place, an arena of opposites: safety and danger, success and failure, comfort and pain, power and helplessness and elation as well as times of frustration and sorrow." 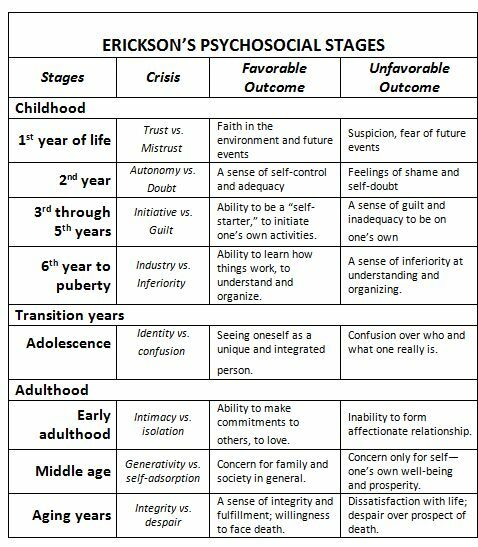 I would love to know what you think about Erikson's stages of psycho/social development. 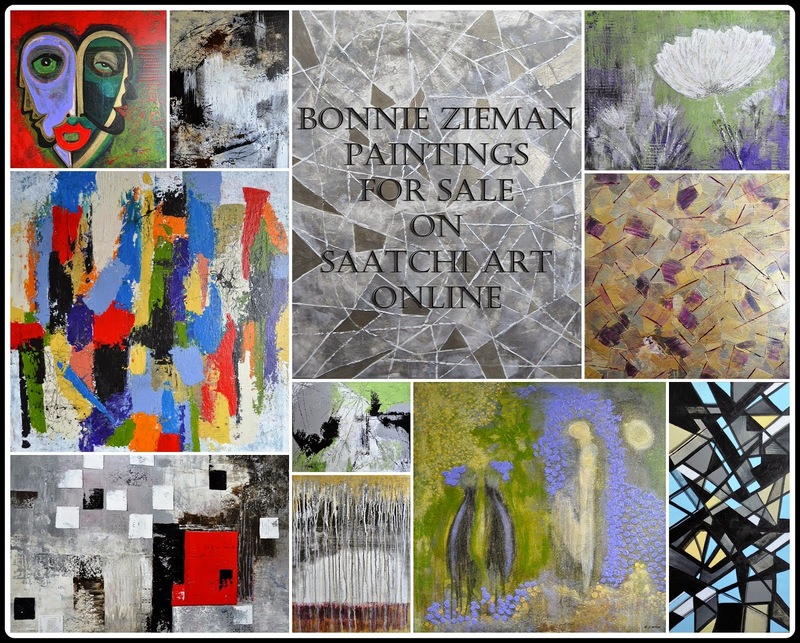 Hope you will share your thoughts with a comment. I can't begin to tell you how much this is giving me perspective right now and a framework to work from. Very suddenly, my father has decided he wants to complete projects, type up stories and turn them into a book, etc... with what might be days or weeks left here. I am trying to sift through these requests and not make light of them, while still honoring his need to feel some closure. I can't wrap my head around the possibility of completing one of these let alone 4 or 5 of these. Vicky: It makes me happy to hear that this post is helpful to you. After he dies he will not be saying, "but I didn't get to ....", he won't know what got done and what didn't... What will be important THEN is YOUR knowing you facilitated his doing/working on what was important to HIM, UNTIL he died. He is a lucky man to have such an insightful, devoted daughter. All parents and their children could benefit from this awareness early on! Some seem to grasp the nurturing of children so well, while others seem lost. Such simple charts, but great knowledge. I like the quotes. I guess I am entering the 'old age' phase. Hi Wanda: That is so true. Some do seem to have a natural ability to attune to needs and circumstances. 'Old age' was one of the mid-twentieth century terms I was referring to ... I'll soon be there and will not feel like I'm in 'old age' when I am 65! Anyway - forget the gaffs and appreciate the information is what I say! a useful heuristic-yardstick. As Elisabeth Kübler Ross said near her own death: "Stages are helpful but messy and not nearly so clear." There is so much to ponder here, Bonnie, in relation to my own life and, especially, to that of my daughters, now between adolescence and young adulthood. I appreciate the introduction to Erikson. I was especially interested in the stages of teens, since I’m raising teens and writing for them. Identity vs. role confusion describes good YA literature in a nutshell. 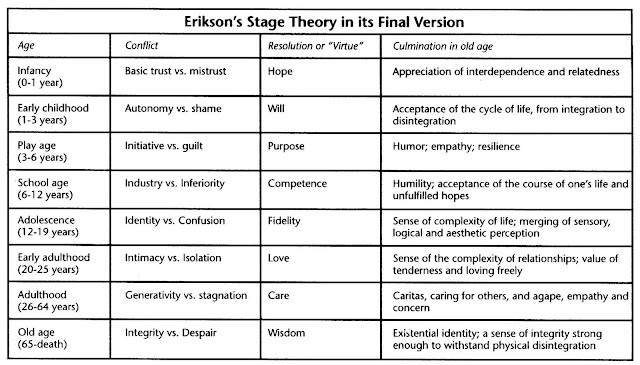 Thanks for the summary of Erickson’s theories. It makes sense to me, but I think all those virtues and conflicts exist throughout adult life, although the emphasis shifts. Cloudia, - Excellent points. Trying to fit ourselves into preordained slots is unproductive. Stage theories can identify commonly seen themes and patterns of behavior that can be illuminating. As with everything, we have to be flexible and in the end know that we are the best expert on our development and needs. As you may have seen from other comments, however, such generalizations and explanations can prove helpful and are certainly worth consideration. Lorenzo, Yes it can be helpful to understand the developmental needs and resulting behaviors of the different periods in the lives of our children, other loved ones, and ourselves. It is not a precise template, but it can be an informative guide. Hi Sarah, Yes we do revisit past themes ... very common. You might find it interesting to read more of Erikson on typical adolescent development, tasks, conflicts to build your characters - although, no doubt you have studied teens in depth - by means of Erikson or others. A tour de force, an essay that I cannot comment on instantly. Thank you so much for your work here and let me assure you that it has given me much food for thought and - quite possibly - action. There is so much here for parents and individuals as they age. Interesting concepts about middle age and older age: generativity vs. self-absorption; integrity vs. despair. I can see aspects of these qualities in others and with these charts one wonders more about the developmental influences behind them. Turquoise, we all have our own timing! Paul, Yes, we almost never know the hurdles a person has had to surmount. I just blogged about your wonderful post here and provided a link. Thanks. This was a pretty helpful post in my analysis of life stages. Thanks for sharing with all of us.